New Year's Eve Plans? - San Diego Dining Dish! With the bustle of the holiday season upon us (Happy Hanukkah! 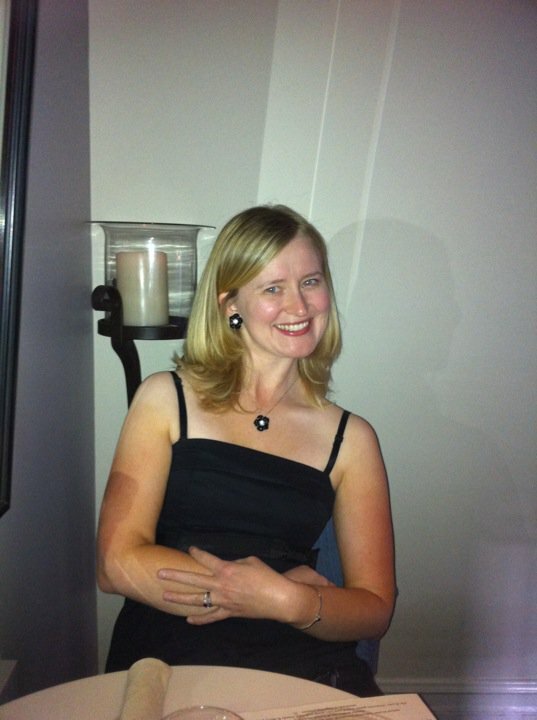 ), it's easy to lose track and forget to plan New Year's! Here a round up on what's going on in San Diego to help you decide how to spend the last night of 2014! 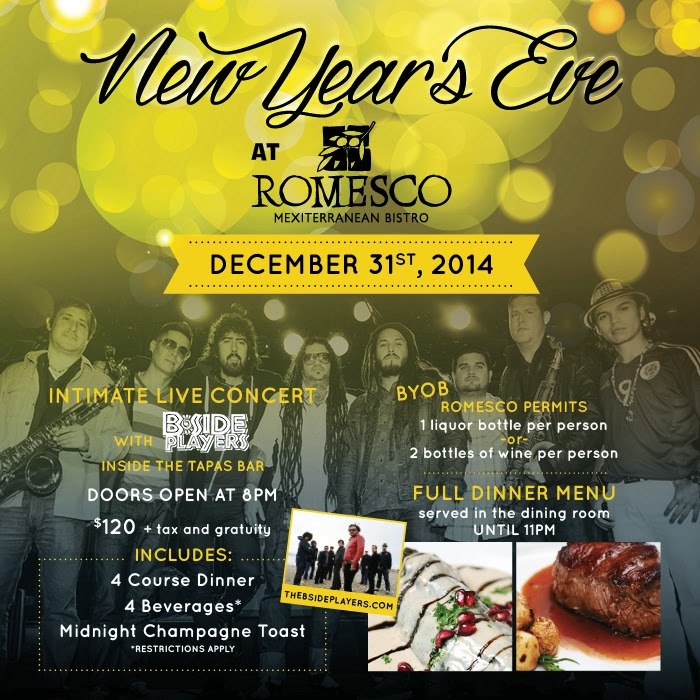 If you’re looking for an all-inclusive New Year’s Eve, Level 9, located atop Hotel Indigo, is the place to go. One ticket price includes admission to two spaces within the venue, including Hotel Indigo’s restaurant and bar, Table 509 and Level 9, the rooftop bar and lounge with sweeping views of downtown San Diego. Enjoy DJ music and appetizers like popcorn shrimp and fries from 9 p.m. to 11 p.m., and an open bar from 9 p.m. until 1:30 a.m.
midnight and complimentary party favors. Tickets are $100 individually or $190 per couple and can be purchased at www.wanttickets.com. For $75 per person, Union Kitchen & Tap’s Gaslamp location offers three courses from Executive Chef David Mango. Start the meal with lobster bisque, baby arugula salad or Washington State Hama Hama oysters on the half-shell. The main course is your choice of baked chicken Kiev, an eight ounce hickory smoked filet mignon, lobster thermidor, Colorado rack of lamb or a vegetable risotto. End the meal with tiramisu with mascarpone mousse, an acai tart with mixed berry marmalade or a peanut butter and salted caramel cake. New Year’s Eve dinner at ViVa Bar + Kitchen is $48 per person and includes three courses and a champagne toast. V is for variety at ViVa and diners select one of five choices for a main courses, including surf-n-turf, duck two ways, lamb shank, scallop duo or veggie paella. Add selected wine pairings for an additional $20. Located in the heart of the lively Gaslamp, barleymash is bringing you the party of the year with their annual New Year’s Eve Bash. For guaranteed entry, contact Lizzie (lizzie@barleymashsd.com) to book a table with bottle service. Sleep it off and visit on New Year’s Day when barleymash will be open from 10 a.m. until 2 p.m. for brunch. cherry compote. 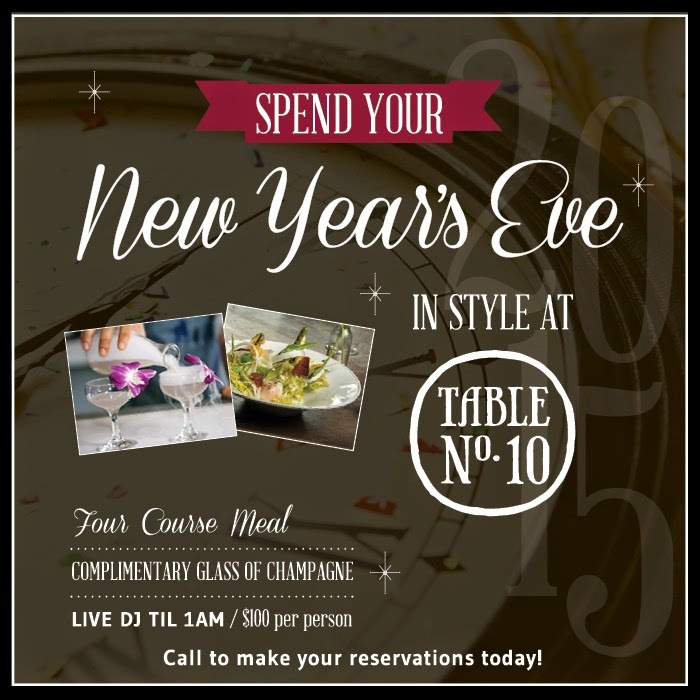 New Year’s Eve dinner is priced at $100 per person and is accompanying by complimentary glass of champagne in preparation for the perfect New Year’s toast. Live DJ jams will be playing till 1 a.m. to help you usher in 2015 with a bang. Welcome in the new year at Wang’s North Park. Starting at 9 p.m., indulge in the hosted hors d’oeuvres and buffet of Wang’s favorites for $75 per person. For libations, explore your options at Wang’s open bar, featuring domestic beers, house wines and well cocktails. Last but not least, the feast will be followed by a complimentary glass of champagne to toast the ball drop. Looking for dinner before midnight? Wang’s dining room and main bar will be wide open and serving until 11:30 p.m. Located in one of North Park’s most historic buildings, West Coast Tavern’s slick, urban vibe makes it the perfect spot for a festive New Year’s Eve and DJ Louis is ready with tunes. Table reservations are required starting at 9 p.m. and include champagne for toasting and party favors. 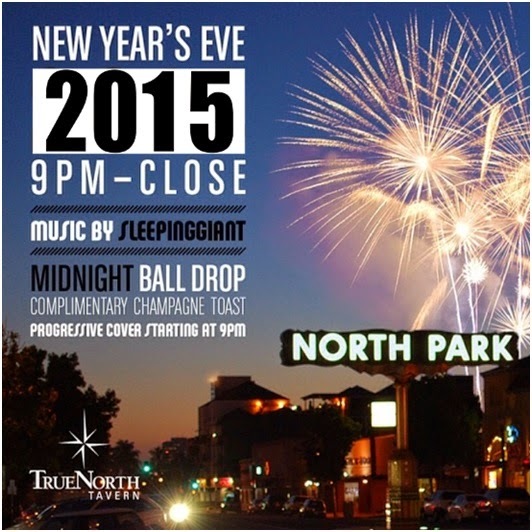 Welcome 2015 at North Park’s favorite sports bar, True North Tavern. With outdoor patios, full-service bars and pool tables, True North Tavern features music by Sleeping Giant’s DJ Hevrock. The progressive cover charge starts at $10 at 9 p.m. and increases by $5 until midnight and includes a complimentary champagne toast as the ball drops. Join friends at Shore Club for New Year’s Eve for a midnight Fireball toast and DJ Tony A. This favorite bar amongst locals will not have a cover charge, bottle service or any of that other stuff that keeps folks from bar hopping on New Year’s Eve. For those who just can’t away from the beach and ocean breeze, good news – New Year’s Eve in Pacific Beach is going to be an exciting one. With a wide selection of grub and a central bar, Tavern knows how to throw a real party. Venture over to the coastal-cool bar and eatery on New Year’s Eve for party favors, a countdown to the New Year and a champagne toast at midnight! Located in the heart of Mission Beach, only steps away from the ocean, Sandbar Sports Bar & Grillis famous for its always lively atmosphere and one-of-a-kind frozen concoctions, so you can count on the joint to throw the ultimate New Year’s Eve Bash. With tickets available for presale and the day of, you and your entourage can join the festivities with a champagne toast atmidnight and half-priced drinks of your choice. If you’re headed to Normal Heights, consider the Hollywood Nights-themed party with DJ Junior at The Air Conditioned Lounge. Complete with a red carpet entry way and a step and repeat with a photographer, guests are encouraged to dress like their movie career depends on it. The best-dressed will win gift cards throughout the evening. Tickets go quickly at $25 per person until December 25 and $30 afterwards and the event typically sells out. Ticket price includes your choice of shooter from the bartender’s script, party favors and a champagne toast at midnight. Equal parts casual diner and posh lounge, Uptown Tavern is a local hot spot for celebrations of any sort. For New Year’s Eve, Uptown Tavern is throwing the iconic New Year’s Eve Bash, with DJ Tone Capone starting at9p.m. For a New Year’s Eve celebration that’s a bit off the beaten path, head to Romesco Mexiterranean Bistro to celebrate Mexican style. Dig right into the all-inclusive Tapas Bar starting at 8 p.m. while Baja restaurateur Javier Plascencia’s unique dinner menu is served until 11 p.m. For $125 per person, Romesco is offering a four-course dinner with four included drinks. Since toasts of all sorts are in order for the night, including a complimentary champagne toast at midnight, guests are welcomed to bring their preferred alcohol of choice to accompany their dinner – either one bottle of alcohol or two bottles of wine per person. After the feast, be prepared to show off your best dance moves with the help of live music, courtesy of B-Side Players and their Latin-Soul Funk sound.